This a marketing company, thats why their master minds are in television so often. Today i've joined the free webinar but was bored after minutes and asked why he isn't at the golf course yet. He claims to the listeners that he has condensed price levels (no round numbers) at the FDAX at which he is selling or buying with profit (without any other relation). If they hadn't muted me and finally logged me off i had done this a couple af minutes later. I only was curious what further jokes would come. Big Mike is an excellent resource to learn trading at your own pace without spending any money. Use this and stay away from DTI. Their site and email spam ads have so many "affliate" cross promotion of other vendors, and special offers constantly. I stayed on their spam email list for fun to see how much junk I would get, and my email now has literally hundreds from almost daily "offers". I first heard of Tom Busby through his books, which I actually enjoyed and learned some good things from. I gravitated to DTI, attended webinars and signed up for his entry-level class and his DAX class. This was 3 or 4 years ago. But then a subtle change began. 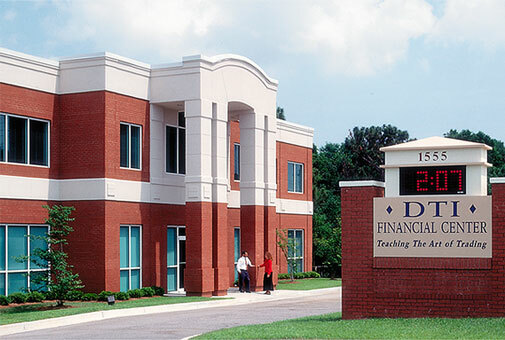 DTI began hiring new people, and the company started marketing new classes. The webinars soon went from providing good information to basically being infomercials. The final straw, for me, was when I paid to go to one of their classes held in Las Vegas. A lot of the class was actually pretty good, and I did get a few ideas that made some money. However, during the class, Tom had said he wanted to speak privately with each member, implying that this would be a chance to give some 1-on-1 time. Wow! So after reading his books, paying tuition for classes, etc., this was a chance to speak about my personal trading and maybe get some individual advice. I walk into the room (a salesman right besides me), and Tom barely glances up from his iPad (I guess trading or whatever was more important than his customers). I actually felt like I was intruding on him. He asks me how I'm doing with my trading, and I tell him some of my experiences. Then he looks at the salesman, spits out a list of 3 or 4 classes that I should sign up for, then goes back to his iPad. Needless to say, the biggest lesson I learned from that course was the importance of relying on myself. Education has always been important to me. But I am much more discriminating now. I saw the man behind the curtain, if you will. I'm still on their mailing list, and still listen in on their webinars maybe 2-3 times per year. But since that class in Las Vegas, I've never been able to sit through the entire webinar. Within the first 5-10 minutes, the "great opportunity to sign up" for such and such class begins. I get that they need to make money to pay for their "free" webinars, and don't begrudge that. But when the ratio of selling to knowledge is 80-20 in favor of selling... well, that "free" webinar just becomes too expensive with my time. And I shut my browser down. A shiort search including some of the older trading forums will show old tom has been scamming for ages. some things never change... All of his info is readily available for free and mostly targeted at those who need hand holding. I am a current subscriber to DTI. I have to say be wary of spending money with these guys. If you happen to be in a product with Tom Busby, be prepared to spend 3/4 of the time listening to Tom explain what a brillian trader he is, along with occasionally telling you what trading was like 30 years ago. The futures room is not too bad, because Tom rarely visits that room. The other products are very expensive and of questionable value. There's even an actual building photo which says "teaching the art of trading". Their marketing must have been quiet lucrative. A few years ago when I attended one of their ad webinars, I was soon called after on my phone# by some salesperson wanting to sell some package or whatever. I never try to give out phone numbers again on attending these kinds of webinars. I'm thinking DTI is heavily marketed on all the trading media like "moneyshow" so they get plenty of new business that they don't even have to post on investimonials..
"I felt like a fish with a hook in its mouth!" Last edited by Cloudy; March 20th, 2016 at 06:45 AM. There's even an actual building photo which says "teaching the art of trading". Wow, surprised, but I stand corrected nevertheless.